Terrorists use ambulances for transportation (IDF Spokesman, July 22, 2014). 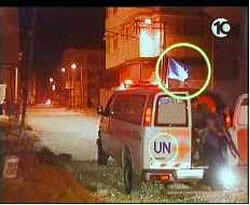 A UNRWA ambulance evacuates a wounded Palestinian and terrorist operatives from the combat zone (Photo courtesy of Israeli Channel 10 TV, May 11, 2004). 1. Hamas and the other terrorist organizations have frequently made use of hospitals and other medical facilities for various military purposes. That is because they know the IDF does not attack medical facilities, and using a medical facility provides their terrorist operatives located there with a kind of immunity. For the same reason they use ambulances to move terrorist operatives and weapons from place to place in combat zones. They repeat the modus operandi in Operation Protective Edge. 2. William Booth wrote in the Washington Post on July 15, 2014, that "At the Shifa Hospital in Gaza City, crowds gathered to throw shoes and eggs at the Palestinian Authority's health minister, who represents the crumbling 'unity government' in the West Bank city of Ramallah. The minister was turned away before he reached the hospital, which has become a de facto headquarters for Hamas leaders, who can be seen in the hallways and offices" (ITIC emphasis). Washington Post correspondent Nick Casey Tweeted that Hamas used the Al-Shifa'a Hospital as a "safe place" to meet with the media. 3. 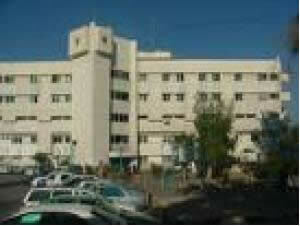 Al-Shifa'a Hospital, located in the western part of Gaza City, is the largest and most important hospital in the Gaza Strip. Hamas used it for military-terrorist purposes in Operation Cast Lead as well, when senior Izz al-Din al-Qassam Brigades operatives located themselves at the hospital, closing off some of the wings (See below). 4. 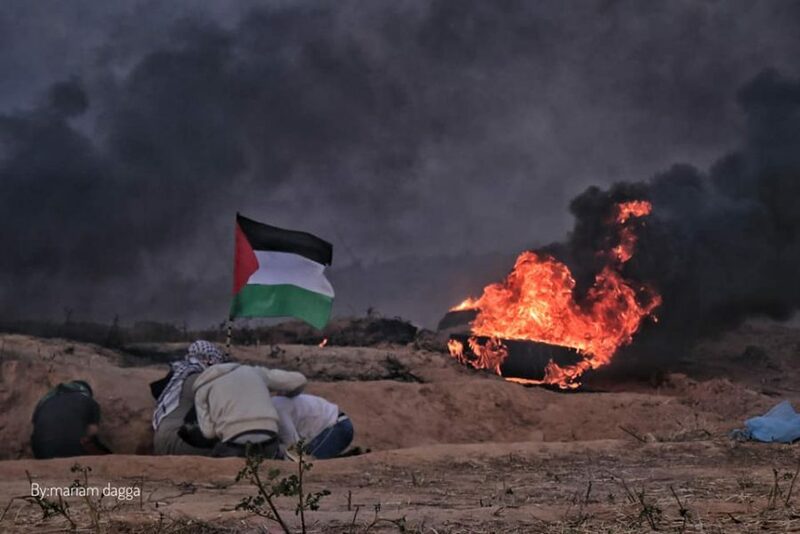 In addition, according to the IDF Spokesman, during the ground operation an IDF force identified two Palestinian terrorist operatives using ambulances to move through the Gaza Strip (IDF Spokesman, July 22, 2014). They were seen getting into the ambulance and driving away; the driver was apparently wearing a white coat. The IDF did not attack the ambulance out of concern for possible civilian passengers. The IDF Spokesman posted a video documenting the event of YouTube. Click https://www.youtube.com/watch?v=7O114V9PdmM for the video. 5. Using ambulances for military-terrorist purposes, as exposed in Operation Protective Edge, is well known from the past. Before and during Operation Cast Lead Hamas used them frequently (See below). 1) Senior Hamas and Izz al-Din al-Qassam Brigades figures hid in the hospital during Operation Cast Lead. They closed off some of the departments, stationed armed guards and closely examined everyone in the hospital. The senior figures who sought shelter in the hospital included Mahmoud al-Zahar and Sayid Siyyam. In addition, Ismail Haniya, head of the de facto Hamas administration, set up his headquarters in the hospital’s burn ward (or under the maternity ward, according to another version). 2) A Hamas operative detained during Operation Cast Lead told his interrogators that senior Hamas operatives took over a large bunker under the hospital and hid there. 3) Terrorist operatives established positions near the hospital to launch mortar shells. 4) Hamas transferred weapons from buildings close to the hospital. 5) The teaching and training area of the hospital next to the new delivery room was used as living quarters by Hamas operatives. 6) A tunnel was dug under a mosque near the hospital, which served as a direct escape route from one to the other. The tunnel opening and a hidden room were built under the maternity ward. 7) A Palestinian suspected of collaborating with Israel was executed in the hospital. 1) Fatah sources reported that Hamas prepared the ground floor of the hospital’s X-ray department as a jail and interrogation facility. That was after the prison in the Shati refugee camp had been completely destroyed by the Israeli Air Force. The equipment belonging to the X-ray department was moved to the hospital’s first floor or lobby (Al-Ahed, a Fatah-affiliated website, January 21, 2009). 2) The Salam Fayyad government’s ministry of health issued an official statement accusing Hamas’ security services of having turned medical centers into jails and interrogation facilities during Operation Cast Lead. The statement expressed the surprise of the Palestinian people and the entire world that after the IDF operation, Hamas’ security services took over the Shifa’a hospital, especially the cancer ward and the new building which was supposed to be used by specialists. According to the statement, turning the medical facilities into interrogation centers entailed removing the medical personnel, who had answered the call of the Fayyad government’s ministry of health and returned to work in view of the IDF operation in the Gaza Strip (Ma’an News Agency, February 7, 2009). 3) An article in the Italian Corriere della Sera, published on January 22, 2009, included a statement made by a Gazan named Magah al-Rahman, who said that Hamas had set up an interrogation center for Fatah prisoners in the basement of Shifa’a. He said he heard about it from Democratic Front for the Liberation of Palestine operatives. 8. For military-terrorist use of other hospitals in the Gaza Strip during Operation Cast Lead, see the Appendix. 9. The use of ambulances for military-terrorist purposes as exposed by the IDF during Operation Protective Edge is a well-known modus operandi. Before and during Operation Cast Lead Hamas used consistently and methodically used vehicles with the markings of medical organizations for military purposes. 10. According to Hamas’ combat modus operandi, ambulances and vehicles belonging to international organizations are used to move military operatives between the various battle zones and to transport rockets and other weapons. Such vehicles are used during the fighting to evade examination and exploit the freedom of movement given them by the IDF. The same method was also used by Hamas before Operation Cast Lead, and is currently being used during Operation Protective Edge. 1) Transporting ground operatives and senior figures from place to place. 1) Hamas operatives used ambulances to transport rockets. A number of times Hamas operatives were seen unloading rockets from ambulances to fire them. 2) Hamas sent ambulances to various sites to collect operatives, sometimes disguising them as wounded. 13. An IDF brigadier general testified during the IDF debriefing that in Operation Cast Lead there were at least three incidents where ambulances were identified as carrying armed Hamas operatives along with ambulance rescue teams. 14. 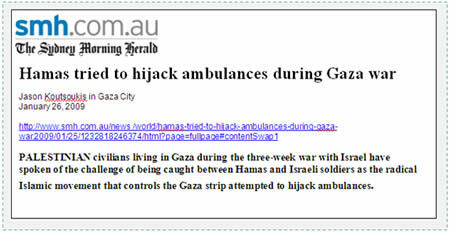 On January 26, 2009, the Australian Sydney Morning Herald (referred to in the Goldstone Report) published an article by Jason Koutsoukis, who interviewed Muhammad Shriteh, a Gazan ambulance driver who evacuated the wounded during Operation Cast Lead. He said that during most of Operation Cast Lead he would “coordinate with the Israelis before we pick up patients… so they would not shoot at us.” He said that the more immediate threat was from Hamas, who would “lure the ambulances into the heart of a battle to transport fighters to safety” (ITIC emphasis). 15. The ambulance driver described an incident which occurred during the second week of Operation Cast Lead, in which the ambulance had been urgently called to a house in Jabaliya. When he entered the house, which had been partially destroyed, he saw three Hamas operatives hiding inside. The operatives, who were scared and nervous, told him to get them out of the house, put them into the ambulance and drive them away. He said he refused, because he knew that if the IDF found him evacuating fighters and not wounded Palestinians they would kill him. One of the operatives threatened to shoot him but he still refused. In the end, they let him drive away without them. 16. Muhammad Shriteh added that on a number of occasions during Operation Cast Lead Hamas operatives tried to take over ambulances belonging to Al-Quds Hospital [located in Tel al-Hawa in Gaza City]. Hospital employees usually received warnings beforehand and removed all the ambulances from the hospital grounds to make it seem as though they were in use, returning them only after the Hamas operatives had left. Statement of the ambulance driver from The Sydney Morning Herald, January 26, 2009. 17. The statements from the IDF and from the ambulance driver are supported by Israeli intelligence information. According to statements made by Hamas operatives during Operation Cast Lead, ambulances were used to transport operatives and weapons. According to other intelligence information, Izz al-Din al-bQassam Brigades operatives used ambulances and motorcycles to patrol at night. 1) On January 1, 2009, the Israeli Air Force attacked the Khulafa’a Mosque in Jabaliya. The attack caused a number of secondary explosions, indicating that large quantities of weapons had been stored in the building. A short time later a number of ambulances were seen arriving at the mosque and evacuating several unhurt operatives and weapons which had not been destroyed in the attack. 2) On January 4, 2009, a rocket launching squad was attacked in the northern region of Gaza City. Immediately after the attack a number of ambulances arrived and evacuated the casualties, also taking weapons which had not been damaged. 3) On January 6, 2009, after the IDF had warned it intended to attack a building,several ambulances were seen evacuating dozens of armed operatives. 19. Ambulances were also used to smuggle senior Hamas figures out of the Gaza Strip during Operation Cast Lead. Riding in ambulances, a delegation of Hamas leaders left for talks with the head of Egyptian general intelligence, Omar Suleiman. Two of them, Jamal Abu Hashem and Ayman Taha, left the Gaza Strip for Egypt hiding in an ambulance to ensure they would not be attacked by the IDF (Egyptian TV quoting a source in the Hamas police, January 9, 2009). Eye witnesses said that they saw other senior Hamas figures in another ambulance (ibid.). 20. Mahmoud Abbas mentioned the issue in a speech he gave at the American Arab University in Jenin. He attacked Hamas and criticized the leaders of the organization who had used ambulances to flee to Sinai during Operation Cast Lead (Palestinian TV, October 17, 2009). A UNRWA ambulance evacuates a wounded Palestinian and terrorist operatives from the combat zone (Photo courtesy of Israeli Channel 10 TV, May 11, 2004). A Reuters report showed two ambulances arriving at an exchange of fire between the IDF and terrorist operatives. Two terrorists wearing uniforms got into the UNRWA ambulance, accompanying a wounded operative who was armed and wearing a uniform. Another armed terrorist in civilian clothes was seeing fleeing the scene. 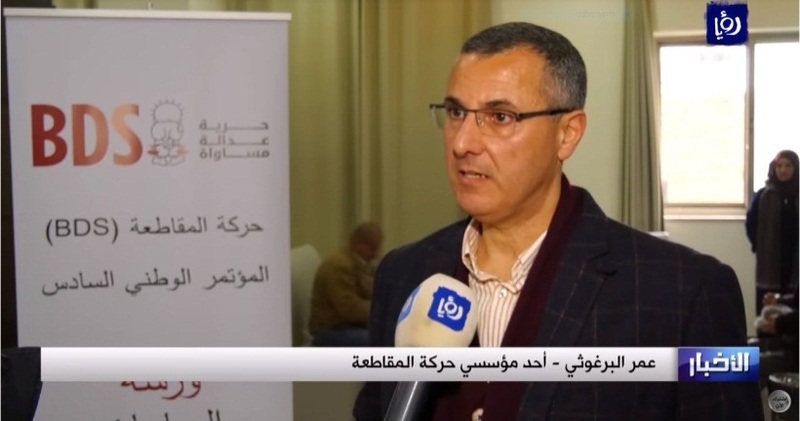 In response, UNRWA head Lionel Brisson claimed that the ambulance driver and nurses ordered the armed men to get out, but one of them got out and threatened the driver, saying that if he didn’t drive directly to the hospital, he would be killed. For further information about the military-terrorist use of hospitals during Operation Cast Lead, see the March 2010 bulletin "Hamas and the Terrorist Threat from the Gaza Strip, the Main Findings of the Goldstone Report versus the Factual Findings," Section Two p.180 ff.